I had an extra ball of wool left over from making a Rustic Potato Chip Scarf. So, I thought it would be fun making up a new pattern for a small project like neck scarf which required only one ball of yarn. You can choose any yarn you like if wool irritated you. The yarn has to be at lease 131 yards. I used every bit of my wool. Buy extra ball of yarn if you want the scarf to be a little longer than 14 inches (that's just the body part around the neck). 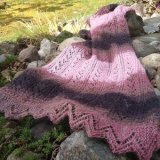 I choose Feather and Fan lace pattern for this neck scarf because I love the wavy beginning and ending parts of it. 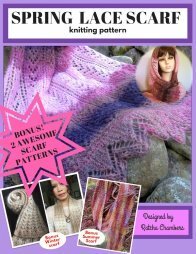 I'm sure many of knitters are pretty much familiar with feather and fan pattern. Note: YF is "yarn in front" pretty much works the same way as yarn over. Row 3: K1, [k2tog] 3 times, [yf, k1] 6 times, *[k2tog] 6 times, [yf, k1] 6 times; repeat from * to the last 7 sts, [k2tog] 3 times, k1. Repeat Row 1 to 4 two more times. Row 1: K1, k2tog, * yf, k2tog; rep from * to the last st, yf, k1. Row 3: K2, * yf, k2tog; rep from * to the end. Row 1: *K2, p2; rep from * to the last 2 sts, k2. Row 2: Purl the purl stitches, knit the knit stitches. Repeat Row 1 and 2 four more times. Row 5: K1,[k2tog] 3 times, [k1, yf] 6 times, [k2tog] 6 times, [k1, yf] 6 times, [k2tog] 3 times, k1. Row 3: K1, [k2tog] 3 times, [k1, yf] 6 times, [k2tog] 6 times, [k1, yf] 6 times, [k2tog] 3 times, k1. Repeat row 1 to 4 for 17 more times. You can make it as long as you like on the body part. Just keep repeating this pattern. Slip the 1st, 3rd, 5th, 7th, 9th, 11th, 13th, 15th, 17th, 19th, 21th, 23th, 25th, 27th, 29th, 31st, 33rd, 35th on to a stitch holder while placing the rest of the stitches (2rd, 4th, 6th,......and so forth) onto a needle. Now you should have 18 stitches on the holder and 18 stitches on the needle. Leave the stitch holder at the front of work. 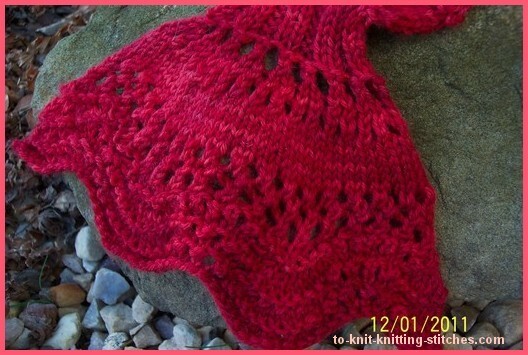 Start working with the stitches on your needle in ribbing. Row 1: K 2, p 2, to the last 2 sts, k2. Row 2: K the k sts, p the p sts. Repeat the row 1 and 2 four more times. Slip all sts onto a stitch holder. Cut off yarn leaving 6 inches tail. Slip the 18 stitches from the first holder to knitting needle and begin 2 x 2 ribbing as mention in the above (keyhole 2x2 ribbing pattern). Do not cut yarn when completed. Next row: Knit the stitches off the needle and the holder at the same time. If you find it too difficult to knit both stitches at the same time, you can do the slipping method like this; While holding the non working needle (the one with the stitches on it) and the stitch holder in your left hand and with the working needle in your right hand, slip the 1st st from the needle and knit the 1st st off the holder then pass the slip st over the st just knitted.(skp). When completed you should now have 18 sts left on the needle and a key hold ribbing, yeah! Row 11: K1, *yf, k2tog; rep to end. Row 13: Same as row 9. Bind off loosely. Cut off yarn and weave all the loose ends behind work. Block piece for a nice finish. Both ends should be straighten up after blocking. 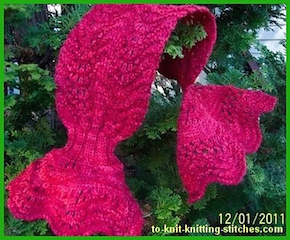 Then, send me a picture of you wearing the neck scarf you knit! Note: Both ends will not be identical but will look pretty!